The story immediately follows the exorcism at Gerasa. 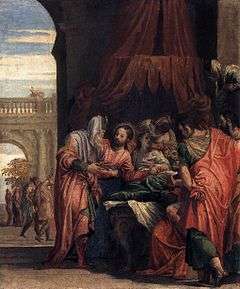 Jairus, a patron or ruler of a Galilee synagogue, had asked Jesus to heal his 12-year-old daughter, who in Mark's and Luke's accounts was dying, and in Matthew's simplified account, had already died. Jesus continued to the house, where he informed all those present that the girl was not dead but asleep. He then went upstairs and restored the little girl to life. In Mark's account, the Aramaic phrase "Talitha Koum" (transliterated into Greek as ταλιθα κουμ and meaning, "Little girl, I say to you, get up!") is attributed to Jesus.